Pope Francis has already made headlines for choosing a five-year-old Ford Focus as his preferred papal transportation, part of a public emphasis on thrift and poverty. But last weekend, the pontiff expanded his garage with the addition of a 29-year-old sedan with 186,000 miles as his personal car. It's too bad Click and Clack retired before they could take a call from Vatican City. 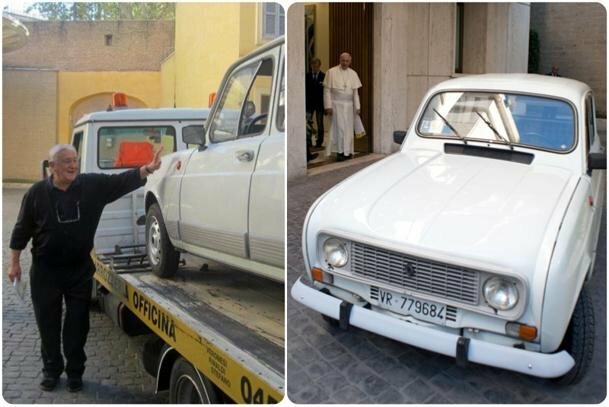 According to the Catholic News Agency and others, the car above, a 1984 Renault4, was donated to the pope by Italian pastor Renzo Zocca. Zocca had written Pope Francis earlier this year, offering to donate the car which Zocca had used for decades while working in impoverished neighborhoods of Verona, as a symbol of their shared concern for fighting poverty. A month ago, Francis called Zocca and asked why he didn't just donate the car to someone else who needed it. 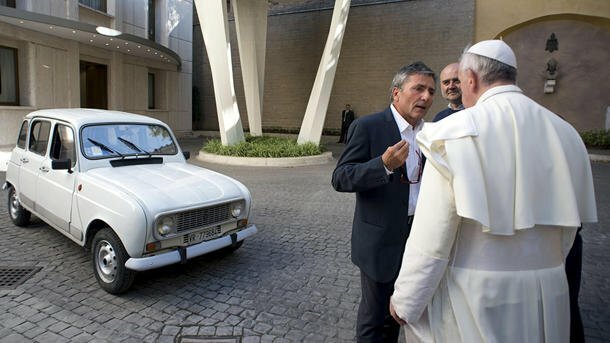 â€œI answered that this car had already given much to the poor and now it had to go to the pope," Zocca said. 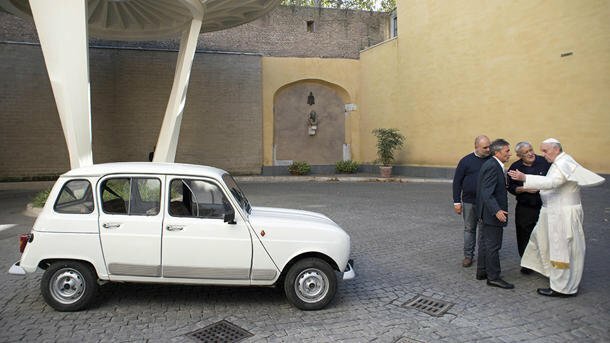 On Saturday, Zocca and about 100 well-wishers delivered the Renault4 â€” after a tune-up to an engine that made 34 hp on a good day â€” to Pope Francis, who took the keys and climbed behind the wheel, telling Zocca he had driven the same model while living in Argentina and "it had never let him down.â€ Other media reports relay that one Swiss Guard was slightly concerned about becoming a traffic cop, saying â€œNow we are going to be a little worried because weâ€™ll have to watch what Pope Francis does with that Renault4.â€ But maybe it's not so surprising that a pope should be an old car aficionado; as anyone who owns a vehicle sporting a couple of decades and a few hundred thousand miles can attest, they're not for people lacking in faith.